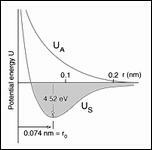 The first credible failure criterion was proposed by Coulomb in the late 1700’s. This was for application to isotropic materials under three dimensional stress conditions. A failure plane was postulated to be activated by shear stress but with a possible linear dependence of the critical shear stress level upon the transverse normal stress component acting upon the failure plane. Thus the failure criterion involves two properties or parameters. About one hundred years later Mohr put the criterion into the form shown in the figure through the employment of his celebrated “Mohr’s Circle” construction. 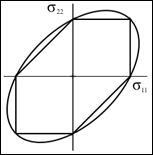 The criterion is now known as the Coulomb-Mohr or Mohr-Coulomb form. It is compact, elegant and easy to use. Unfortunately, it has been found over the years to give an unrealistic and unsatisfactory representation of the failure behavior for the different classes of engineering materials. Nevertheless, their criterion has always been mentioned and sometimes, although infrequently, used. It is a remarkable tribute to Coulomb and to Mohr that this first developed failure criterion had at least enough substance to endure while so many other proposed forms did not. The many discarded failure criteria give convincing evidence of the scale of difficulty for the field. 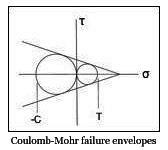 Coulomb’s and Mohr’s historical efforts provided the impetus for the recently developed homogeneous and isotropic material failure criterion that is outlined in Section II.